We help – typically large – organizations create one-click software delivery systems so that they can deliver software in a more rapid, reliable and repeatable manner (AKA Continuous Delivery). The only way this works is when Development works with Operations. As has been written elsewhere in this series, this means changing the hearts and minds of people because most organizations are used to working in ‘siloed’ environments. In this entry, I focus on implementation, by describing a real-world case study in which we have brought Continuous Delivery Operations to the Cloud consisting of a team of Systems and Software Engineers. For years, we’ve helped customers in Continuous Integration and Testing so more of our work was with Developers and Testers. Several years ago, we hired a Sys Admin/Engineer/DBA who was passionate about automation. As a result of this, we began assembling multiple two-person “DevOps” teams consisting of a Software Engineer and a Systems Engineer both of whom being big-picture thinkers and not just “Developers” or “Sys Admins”. These days, we put together these targeted teams of Continuous Delivery and Cloud experts with hands-on experience as Software Engineers and Systems Engineers so that organizations can deliver software as quickly and as often as the business requires. A couple of years ago we already had a few people in the company who were experimenting with using Cloud infrastructures so we thought this would be a great opportunity in providing cloud-based delivery solutions. In this case study, I cover a project we are currently working on for a large organization. It is a new Java-based web services project so we’ve been able to implement solutions using our recommended software delivery patterns rather than being constrained by legacy tools or decisions. However, as I note, we aren’t without constraints on this project. If I were you, I’d call “BS!” on any “case study” in which everything went flawlessly and assume it was an extremely small or a theoretical project in the author’s mind. This is the real deal. Enough said, on to the case study. Profile: The customer is making available to all, free of charge, a series of software specifications and open source software modules that together make up an oncology-extended Electronic Health Record capability. Stakeholders: Over 100 people consisting of Developers, Testers, Analysts, Architects, and Project Management. We put together a four-person team to create a solution for delivering software and managing the internal Systems Operations for this 100+ person project. We also hired a part-time Security expert. The team consists of two Systems Engineers and two Software Engineers focused on Continuous Delivery and the Cloud. One of the Software Engineers is the Solutions Architect/PM for our team. 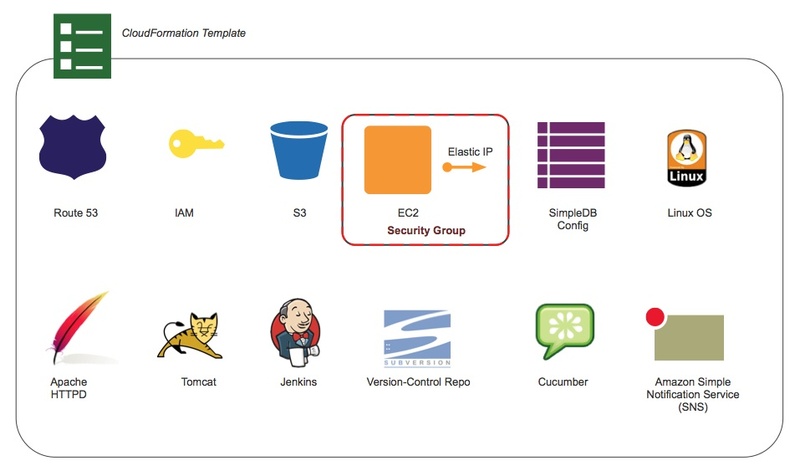 On-Demand Provisioning – All hardware is provided via EC2’s virtual instances in the cloud, on demand (P2). We’ve developed a “Provisioner” (PaaS) that provides any authorized team member the capability to click a button and get their project-specific target environment (P3) in the AWS’ cloud – thus, providing unencumbered access to hardware resources. (P4) The Provisioner provides all authorized team members the capability to monitor instance usage (P6) and adjust accordingly. Users can terminate their own virtual instances (P9). Test framework hooks for running JUnit, etc. Issue Tracking – We’re using the JIRA Studio SaaS product from Atlassian (P10), which provides issue tracking, version-control repository, online code review and a Wiki. We also manage the relationship with the vendor and perform the user administration including workflow management and reporting. Instance Management – Any authorized team member is able to monitor virtual instance usage by viewing a web-based dashboard (P6, P7, P8) we developed. This helps to determine instances that should no longer be in use or may be eating up too much money. There is a policy that test instances (e.g. Sprint Testing) are terminated no less than every two weeks. This promotes ephemeral environments and test automation. System Monitoring and Disaster Recovery – Using CloudKick to notify us of instance errors or anomalies. EC2 provides us with some monitoring as well. We will be implementing a more robust monitoring solution using Nagios or something similar in the coming months. Through automation and supporting process, we’ve implemented a disaster recovery solution. Software delivery is rapid, reliable and repeatable. All resources can be reproduced with a single click – source code, configuration, environment configuration, database and network configuration is all checked in and versioned and part of a single delivery system. Here are some of the tools we are using to deliver this solution. Some of the tools were chosen by our team exclusively and some by other stakeholders on the project. ControlTier – Deployment Automation. Not implemented yet. Development Infrastructure Automation – Automating the provisioning and configuration of tools such as HP QC in a cloud environment. etc. However, like most projects there are many stakeholders who have their preferred approach and tools they are familiar in using, the same way our team does. Overall, we are pleased with how things are going so far and the customer is happy with the infrastructure and approach that is in place at this time. I could probably do another case study on dealing with multiple SaaS vendors, but I will leave that for another post. There’s much more I could have written about what we’re doing, but I hope this gives you a decent perspective of how we’ve implemented a DevOps philosophy with Continuous Delivery and the Cloud and how this has led our customer to more a service-based, unencumbered and agile environment.